When you're running a small business and working hard to make ends meet, vandalism is the last thing you need. 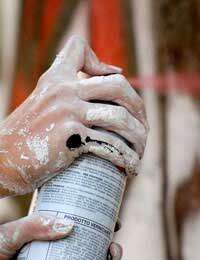 Even comparatively minor criminal damage like graffiti can really set you back, costing a lot of time and money to remove, and insurance rarely covers it in a cost-effective way. But getting together with other local businesses to develop crime prevention strategies can make a big difference. By working with other businesses you can exchange ideas and observations and learn a lot more about what's behind the problem. You can watch out for troublemakers more effectively in the short term and in the long term you can attempt to tackle the underlying causes. Just like ordinary neighbourhood watch schemes, business watch schemes can make a big difference to petty crime in an area. Of course, a business can join a neighbourhood watch scheme, but often businesses are subject to particular types of criminal damage which ordinary members of the public may not anticipate. Other businesses know what to look for. What's more, by watching out for other businesses, you may come to understand more about what's happening to your own. When setting up a business watch scheme it's worth talking to your local police force who should be able to send crime prevention officers round to advise you. This will help you to develop practical strategies for securing and protecting your premises as well as letting you know when you can call in the police to deal with more serious incidents. By discussing crime prevention with the police and with other businesses you can develop a more comprehensive picture of what's going on in your neighbourhood. You can also let vandals know that you're onto their game. Vandalism doesn't occur everywhere in equal measure and sometimes it doesn't have to be happening to your own premises in order to have damaging consequences for your business. If a neighbourhood becomes known for being covered in graffiti and broken glass, for instance, people will stop wanting to shop there. In many areas, overall conditions are better than that but particular places, like underpasses and disused yards, are popular targets for vandals. By working together with other businesses you can co-ordinate campaigns to clean up affected areas and in some cases, make them less accessible to vandals. Often the most effective way to deal with persistent young vandals is to talk to their parents. However parents are naturally inclined to take their children's side, so a single complaint will often go unheeded. By working together with other businesses you can co-ordinate complaints about vandalism to much greater effect. Where necessary you can organise public meetings to get parents involved in crime prevention strategies and encourage everybody to work together to improve the attitudes of local young people. Many young people turn to vandalism because they simply don't have anything else to do. Businesses enterprises can help to solve this problem by investing in local sports and activity programs, and also by working toward the creation of places where young people can hang around together without getting in other people's way or feeling harassed by them - places which can help to give them an understanding of the value of property. You can also help by working together to engage more directly with young people and make sure they feel valued and respected when they visit your premises. Encouraging them to make an emotional investment in the community can do a lot to reduce vandalism in the long term.